On November 28, the John Jay College of Criminal Justice Auxiliary University Detachment held its first planking ceremony in which inductees were officially recognized as members of the U.S. Coast Guard Auxiliary (USCG) program. The ceremony celebrated the establishment of the detachment and included President Karol Mason as well as prominent USCG active duty personnel and senior level Auxiliary officials: Admiral Steven Poulin, Commander of the USCG for the Northeastern United States; Captain Michael Day, Captain of the Port of NY; Commander Grossman, Director of the Auxiliary, First District, Southern Region; Deputy National Commodore Alex Malewski, Northeastern Portion of the US; and Vincent Matsui, Flotilla Commander Flotilla 014-05-03-001. 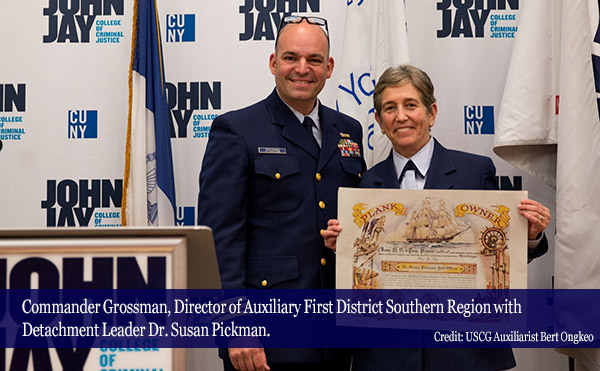 In 2016, John Jay became an official detachment of the U.S. Coast Guard’s Auxiliary University Programs (AUP). The national initiative prepares undergraduate and graduate students for future public service and opportunities to gain boating education, learn about homeland security, and gain operational and leadership experience. The John Jay detachment is affiliated with USCG Auxiliary Flotilla 014-05-03-001, or the lower Manhattan flotilla, which provides rigorous coursework that includes incident management, safe boating and boat operations, communications, marine safety, vessel examination, aviation, and public affairs. Students in the AUP detachment gain access to a leadership capstone course at the Coast Guard Academy in New London, Connecticut as well as a 95-hour hands-on internship program. Creating the detachment at John Jay was spearheaded by Professor Susan Pickman and supported by Chair of the Department of Security, Fire and Emergency Management Charles Nemeth, who immediately recognized it as a program that would generate great rewards for students, especially for those who want to enlist in the Coast Guard. Students who complete the AUP have a 73 percent chance of being accepted into the highly selective Officer Candidate School. That John Jay now has an AUP detachment is important for a college that has so many students who have either served in the military or are interested in learning more about what the military has to offer. With over 525 veteran currently enrolled, John Jay has one of the largest veteran populations at CUNY. Richard Pusateri, Manager of the Military and Veteran's Services Office, says that John Jay’s commitment to supporting veterans extends to providing veteran students with opportunities to be honored, including the SALUTE National Honors Society Induction that immediately followed the planking ceremony. Last year, John Jay became a member of the SALUTE National Veterans Honor Society, a national veteran student honor society that was founded in 2009 and has chapters at over 200 U.S. colleges and universities. At the ceremony, several students were inducted into the society, which was shortly followed by dinner and remarks from Keynote Speaker Rear Admiral Steven Poulin. Trustee Gerry Byrne, who has generously supported veterans on campus, was also honored at the event. The planking ceremony and the induction ceremony marked the end of a series of month-long events in November to commemorate Veterans Day.